Thursday March 3rd 1881 It snowed and blowed all day I sewed in the forenoon made a cushion for Mothers new rocking chair and knit in the evening. 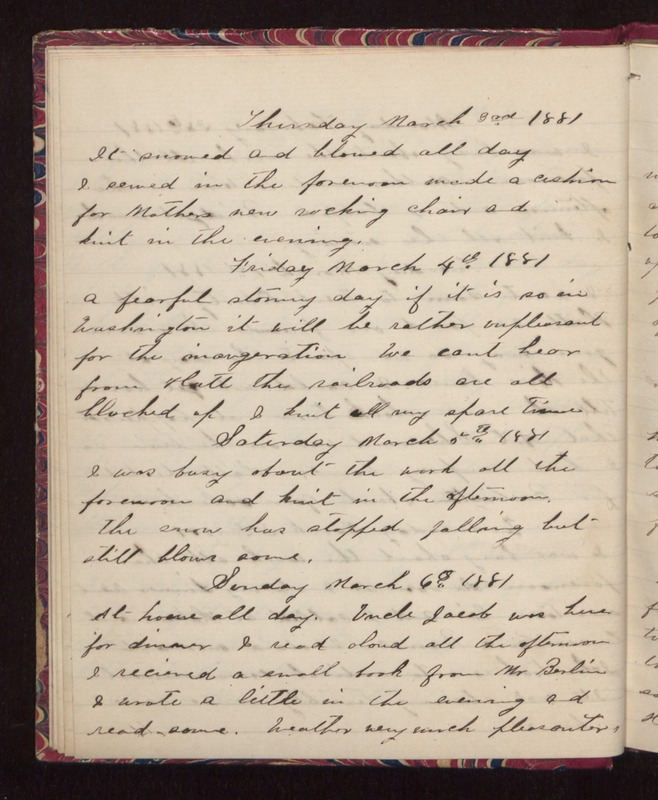 Friday March 4th 1881 A fearful stormy day if it is so in Washington it will be rather unpleasant for the inaugeration We cant hear from Hatt the railroads are all blocked up I knit all my spare time Saturday March 5th 1881 I was busy about the work all the forenoon and knit in the afternoon. the snow has stopped falling but still blows some. Sunday March 6th 1881 At home all day. Uncle Jacob was here for dinner I read aloud all the afternoon I received a small book from Mr Berlin I wrote a little in the evening and read some. Weather very much pleasanter.